Amerigo is a game of discovery and development. Your goal in Amerigo is to make your name and influence greater than any other explorer who is out to take your new discovery for their own. Before I get into how the game works I must first explain the main mechanic of this game. It’s a dice tower. You drop cubes into the top of it and on its way down some cubes get stuck and some knock out cubes previously stuck making different color cubes and less or more cubes come out. Every round you take 7 turns. In a turn you take the main action cubes for that turn and send them down the tower of destiny. If only that color comes out, that’s the amount of action points you can take, and what type of action you can take, that turn. Usually more then one color will drop out. On that occasion, each player has a choice between the type of action that came out. The number of action points per turn is determined by the largest number of the same color cubes that came out that round. When exploring you move your boats and discover new lands. Once you have discovered a new land you automatically get to set up a settlement. Being the first person to explore and settle on a new land will gain you bonus points. So the more you explore the better. The more you explore and settle the more possible points you will have the chance to make with other actions. It is also valuable to explore already owned lands to gain some influence in the land. Man the cannons! In Amerigo, as you are exploring on the open seas, you are always at risk of a pirate attack. So to keep these ruthless no good pirates from taking your well earned victory points, you build cannons to fight then off. Every time you fight pirates off however, some of your cannons get destroyed and you have to continue to rebuild them to stay safe. If you don’t have enough cannons to fight off the pirate scum, all of your cannons are destroyed and each pirate takes a victory point from you. Once you have settled on a new land you need to help your people to thrive. So you start planning your city to fill the entire land. In this stage you examine the layout of your land and plan to build certain buildings that will gain you the most possible influence and best suit your people, or just get you the most Victory Points. As your cities grow and become a thriving new land, you need to gain new technologies to help you complete your goal of a great name. So in this action you gain any number of ideas that will eventually lead to a new discovery that will make your way to victory clear. Many of these new technology will help you know what route of fame you would like take. As you gain ideas you gain technologies and victory points along the way. In the building phase, you take your perviously made plans and start building them on the most opportune area. As you build you may find natural resources that you may be able to produce later on in the game for more victory points. You also are aiming to complete the most possible buildings in your new land to gain completion points and settlement points. Every time you build you have a choice to build your own buildings which are easy and cheap but if you spend a little more you can build the buildings your people want and gain more victory points. During the production phase, you are aiming to take your recently found natural resources and develop them. Each production you gain doubles the value of that certain type of resource. So each chance you get to produce you should. On this action you are able to simple move up on the track and possibly become first player. Wherever you land on the track you gain the ability to utilize the color your marker is on instead of moving on the track when white cubes are rolled. As you move up on the bonus track you gain victory points along the way. Overall: I think this is a great game! It’s an easy enough game to teach. It may be hard for non-gamers to remember all the possible choices and actions but it’s quite simple if you play games. It’s an easy game to play and there is much replay ability with ever changing new lands, technology order, pirate intensity, and production order. Unless you hate dice towers, then I would recommend it. Players take on the role of New World discoverors, like Amerigo Vespucci and his contemporaries like Christopher Columbus. Like many Stefan Feld games, the game centers around a unique mechanic for presenting available actions. In this case, a large cube tower. In Amerigo, the available and number of actions you have is determined by a cube tower. At the beginning of the game, the cube tower is populated by dropping all the cubes through the tower, where some of them will get “trapped”. The cubes that fall through the tower are then separated and placed around the rondel. For the rest of the game, at the start of every phase, you will take the cubes from a section of the rondel, and drop them through the tower. This may trap some of the cubes you drop, but knock some of the cubes that remain in the tower through. The cubes that fall out of the tower are the available types of actions you can take. So if blue, green and yellow cubes fall out, you can take the blue, green or yellow actions. The number of action points you get is equal to the largest number of cubes of a color that come out. So if 4 blues, 2 greens and 1 yellow comes out, you have 4 action points to spend on blue, green OR yellow actions. It’s a very clever design that ends up presenting 2 or 3 different actions each round, and it seems to sort of balance itself out in a very interesting way. If you drop very few red cubes in, it means there are more reds in the tower, so you can expect them to pop out a bit more regularly than some of the other colors. The main board consists of several other smaller boards that are all different. The number of these smaller board scales for the number of players and they combine together to make islands with harbors, and locations with resources and even treasure chests. Throughout the game, you’ll gain tiles which act as buildings and settlements, you’ll then place these on the islands to gain access to the resources and populate the land to gain victory points. There are a lot of things going on, but they are all very straight forward. The cube tower doesn’t really overwhelm you with choices. While there may be 7 different colors, all with their specific types of actions, you’ll only be focusing on 2 or 3 of them at a time. And it’s mostly predictable as you go around the rondel clockwise, you know when you’re dropping red cubes in, you’ll likely get red cubes out. And in two turns, you’ll be dropping green cubes in, so you’ll probably get green cubes out in two turns. The whole system is very elegant and very clever. This is still a Stefan Feld game, and “point salad” is still an applicable label for this game. But, despite the size of box and number of components, it’s a rather light game for Feld. It doesn’t lack strategic depth, and the game still gives path for clever plays, but it isn’t going to be some grand strategy. Since everyone essentially has the same opportunity of actions, the game is very well balanced between players. There is an advantage to the starting player, but it’s not usually difficult to gain that spot, nor is the advantage that significant. This is a game that would be overwhelming at first glance for new players, but in application, it would be very easy for them to pick up on it. The theme of exploring and discovering is there. Though most of the discovering is essentially “done” by the time the game starts. It’s more about exploring around, placing settlements, and setting up trade for resources. All of these aspects of the theme come through the mechanics. The most abstract aspect though, will be the cube tower. I’m sure this can be developed into the “work seasons” and “weather” throughout the year, but that thematic presence doesn’t shine through. It feels more like a mechanical element to randomize actions. The theme is present, but definitely not the strength or emphasis of the game. The main board is randomly placed together with smaller modular boards. The graphic design of these seem to be decent. It’s easy to relate X with X and Y with Y. It’s nice that this will be different almost every time you play the game, between tile selection and orientation. It’s also scales to a larger size depending on the number of players. But as the size increases, it does change a few parts of strategies. In addition to the main board, there is a bit of a sideboard that isn’t modular. This has the scoring track and is very much more of a “bookkeeping” board. This is where the rondel and other tiles are placed and kept track of. It’s very functional even if it does appear a bit like a spreadsheet. Player boards are also a bit like a spreadsheet. It has different tracks and places to hold resources. The area with the resources could be a bit clearer, as it’s confusing which are your resource tiles and which are your production tiles. This is important as you’ll have to multiply resource and production tiles with each other for end game scoring. The game has a lot of chits. This is also where some graphic design seems to fall a hair short. There are an absolute plethora of tiles, but it is a little laborious to go through and make sure you only grabbed the 2 player or 3 player tiles. You also want enough table space to display a lot of the chits. Keeping track of a lot of the chits and where they are and why they are there is a bit of a task and demands a lot of space. There are a lot of wooden pieces in this game. There’s a metric ton of cubes for the cube tower, there are settlements, there are ships, there are markers. They all seemed to be in decent quality. The brown, green and red colors all seem to have a similar vibrance about them which could be difficult for some colorblind people. Specifically the brown and green cubes may be difficult to distinguish. A great insert for this game. Very well designed and laid out. It’s designed both for safe shipping and safe storage over everything. I don’t know how well it would store vertically, as the box is massive, but if you can find a way to keep the lid on well, it would probably stay just fine. I recommend placing the spent punchboards under the insert to bring the insert closer to the lid. This makes the lid useful in holding down the components in the insert as it shifts around. Queen delivers another clear rulebook. They seem to always break down difficult concepts into simple illustrations and directions. It’s very easy to reference. It didn’t leave anything unclear the first time it was played. It’s a bit sterile, but it does the job well. The art is a little all over the place. There are vibrant colors, but some pastels with the boards. Not a lot of life giving art or flavor to anything, except the cube tower, which is laid out like an old lighthouse. The main board is very pretty, but ultimately a bit lifeless. Some of the tiles you lay down have some very nice art work on one of the sides that has buildings and villages in the color of the player. With replay, I find that the game has a lot of different ways to go about strategy. You can go heavy in technology, heavy in exploration. Heavy in managing resources and trade. You can go and claim small islands, or try and focus more on larger islands. And then there is anything in between. Strategy alone, this game offers a lot of replayability. Then you add in the random elements of the modular board setup, differing strategy with number of players, and just how the cube tower determines the type and number of actions. I see this game getting played for years and always having something new to try. Avid euro gamers looking for something a bit lighter and quicker to play. People who want to try something in the euro-style games. Gamers who want to try a Stefan Feld game for the first time. Those looking for a simple to learn – difficult to master game. Strategy gamers that don’t care too much about a random elements. Power gamers looking for a “quick” 60-80 minute game. Thematic gamers should probably avoid this one. The theme is present, but a little dry and the mechanics don’t really “invoke” the theme. People who don’t like games that may feel a bit fiddly should avoid this one. Those that are expecting a heavy “typical Feld” euro game should either reset their expectations or avoid this one as well. I found this game to be an absolute joy. It’s fast, light, but it isn’t shallow. It has random elements, but it isn’t swingy luck. It’s a random element that seems to have a bit of a fair memory. I wasn’t expecting too much from this one, but it’s another Stefan Feld game that delivered for me. It’s a game I would be up for playing almost any time, and place, which isn’t something I can’t say for the majority of games. It seems to fit the sweet spot for me of not being too light or casual, like with Ticket to Ride or Lords of Waterdeep, but not too big or intense like Terra Mystica or Twilight Struggle. Previous reviewers have covered well the mechanics of the game. In a nutshell, a cube tower will randomize for you which actions you may take each turn and how powerful that action will be. The key takeaway from the mechanics is twofold: one, using the cube tower is a tactile delight. Sure, everyone loves to roll dice but this rather unique randomizer is a welcome change (as long as you double-check the tower to make sure it is working well…see the tips section). Second, and even more important, is the fact that being limited in your actions to what the cube tower provides creates a game revolving around tactics as opposed to strategy. This fact will likely make or break the game for you. If you are insistent that your Eurogame offer a variety of strategies and that you have the freedom to maximize the efficiency of your chosen strategy and thereby measure it against other maximized strategies then this game is NOT for you. However, if you prefer (or are looking for a change of pace) a game where you see how well you can adjust to ever changing options then this is the game for you. Amerigo’s true strength is the realization that though it incorporates so much randomness this randomness is uniformly applied to each player. Thereby, the winner is going to be the one who best adapts to the presented conditions and therefore the loser knows more than in most games that they lost due to poor choices because everyone dealt with essentially the exact same options (there can be no claims that somewhat had better rolls or better luck). All of this means that Amerigo offers an extremely satisfying game experience. Though certainly not dripping with theme, it is delightful to look at and fun to toss cubes into the tower and anticipate what might come out. The decision making is top notch as you get to watch other players make very different decisions when provided with the same options. The game does have a large footprint and the box will take up significant shelf space but to my mind it earns both. It is an excellent euro full of great decision making that’s relatively short playtime ensures it does not overstay its welcome. It serves as a worthy addition to any collector of Stefan Feld titles or as a solid introduction to this celebrated designer’s work. 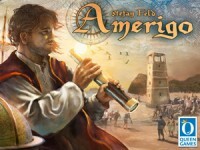 Add a Review for "Amerigo"